Every young woman deserves to know that she is a beautiful example of God’s handiwork, the pride of her Creator’s heart. For the sake of these delicate young flowers under our care, it is imperative that we reconcile society’s negative, critical view of beauty and womanhood with God’s perspective. With her unique blend of charming imagery and remarkable insight, Tani Ifediora illustrates the physical, emotional and spiritual aspects of growing and changing into a godly woman. She offers advice and encouragement for women of all ages, especially for the young girl preparing to blossom into a graceful, mature woman. 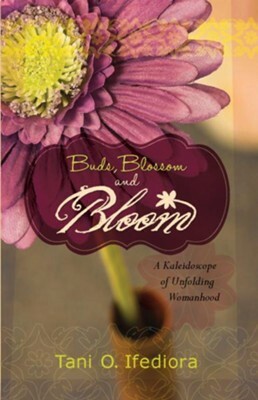 Celebrate the delightful journey of womanhood as you explore this inspirational resource that no woman--budding, blossoming, or living in full bloom--should be without. Tani Ifediora was born in Lagos, Nigeria. She spent her youth studying in Belgium, France, Botswana and Nigeria, and holds a Bachelor of Arts degree in the French Language from the University of Nigeria, Nsukka. Presently, Tani heads a Human Resource Consultancy that accents personal enhancement, social graces and leadership grooming. She is frequently invited to speak for various businesses and nonprofits as well as womens and youth groups. Tani is happily married to Chukie Ifediora, and they are blessed with three sons and two daughters. I'm the author/artist and I want to review Buds, Blossoms and Bloom: A Kaleidoscope of Unfolding Womanhood - eBook.